Meat-packers with plants in Nebraska will be able to own hogs in the state, under a bill passed by the Legislature Friday. And a proposal to spend half a million dollars to try and prevent sexual assaults on college campuses received a public hearing. Nebraska is the only state in the nation to prohibit meatpacking companies from owning the hogs they slaughter. Supporters of the ban say it prevents the further vertical integration of the industry, ensuring free markets where independent hog producers can get better prices. Opponents say it prevents farmers from contracting to raise hogs for meat-packers like Smithfield Foods, which has a plant in Crete, Nebraska and supports overturning the ban. Among those arguing for keeping the ban was Sen. David Schnoor of Scribner, himself a farmer and cattle feeder. Schnoor argued removing this barrier to vertical integration in the hog industry would create pressure for the same thing in the cattle industry. “I know the livestock industry. I need you to listen and listen carefully. I cannot sound the alarm any more loudly,” Schnoor said. But Sen. Lydia Brasch of Bancroft objected to removing the ban, criticizing Smithfield’s ownership by a company linked to the government of China. “This is a game changer. And this is not a game. This is very serious,” Brasch said. With opponents filibustering to prevent a vote on the bill, Schilz moved for cloture, to cut off debate. That requires a 2/3 majority – 33 of the 49 senators. Schilz got 34 votes, and senators then voted 34-14 to give the bill overturning the ban final approval. Gov. Pete Ricketts is expected to sign it into law. 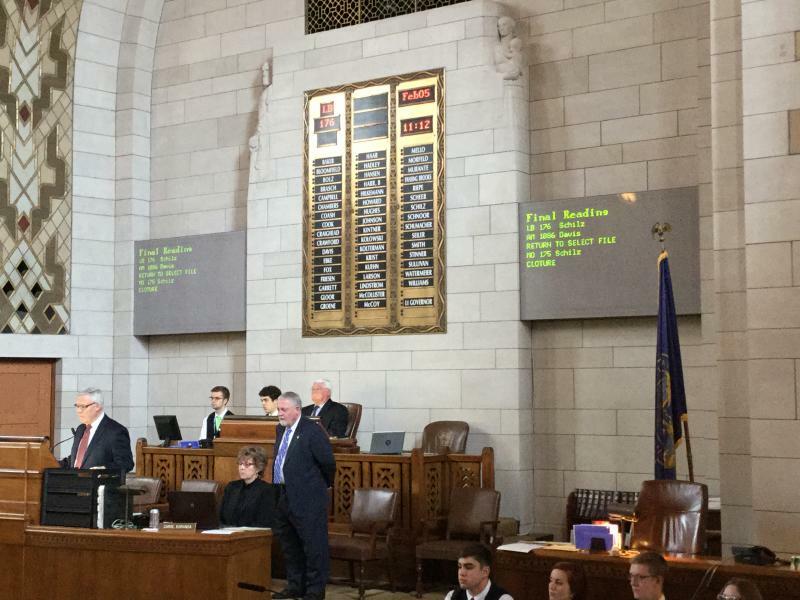 Friday afternoon, members of the Judiciary Committee heard testimony in support of a proposal by Lincoln Sen. Adam Morfeld to spend half a million dollars on grants for colleges in Nebraska to try and prevent sexual assaults. Morfeld said sexual assault is a big problem at colleges in Nebraska and around the nation, where one study found that one in five women are is assaulted during their her time in college. Gallo said it’s also important to train students how to react to sexual assault. He gave an example of how the training he’s received helped him know what to say when a male friend told him his girlfriend had been raped. “The first thing thing that you want to just keep reemphasizing is to tell them that it wasn’t their fault, he said. That sounds obvious, he said, but sometimes the situation can make it difficult. Gallo said sometimes, the person who was sexually assaulted may have been making advances to the other person before the assault. It can be “incredibly difficult” to hear that someone you’re in a relationship was dancing with or kissing another person, “but in the end, you still need to be there for them,” Gallo said. No one testified in opposition to the bill.